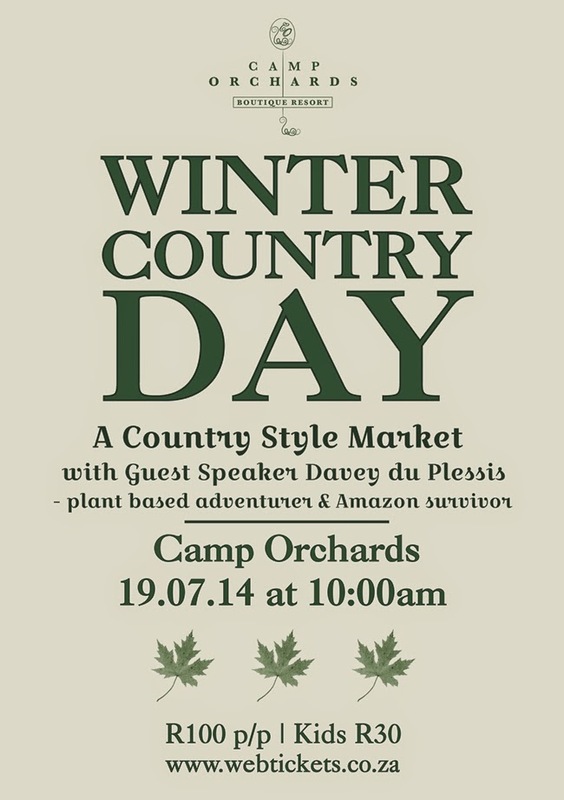 We featured the lovely wedding venue Camp Orchards a few months ago, and with all it's beauty, it has come to us as no surprise that they will be hosting a country style market there this July. It's literally the perfect venue for what they have called their Winter Country Day. The day will be about enjoying the spectacular setting of Camp Orchards, with a focus on health and wellness, as well as a country market. If you are a bride/groom-to-be looking for wedding venues, the Winter Country Day is the perfect opportunity to experience the look and feel of Camp Orchards. While Camp Orchards does invite brides to view the venue by appointment, this country market setting will allow the real setting to come to life, and you will be able to see it in it's full glory. Other good things to know about this event... Guest speaker, Davey du Plessis will share his story based on his book "Choosing to Live". You will be able to enjoy the range of organic and natural products available, the delicious picnic style food stalls, wine tasting and much more. This will be a great time to find a spot to picnic under the trees and listen to the band or challenge friends to a game of boules or croquet. You will also be able to explore our magnificent accommodation available, get to know our spa packages, and enjoy a shop in our country store. Find all the other details in the poster below, and if you'd like to book, click on this link to buy your tickets.